WHEW!!! It ended up being a BIGGER job than I had thought it was going to be. We (Michael had a vacation day and helped me!) ended up having to COMPLETELY EMPTY the wall space; then fill it back up with different stuff! 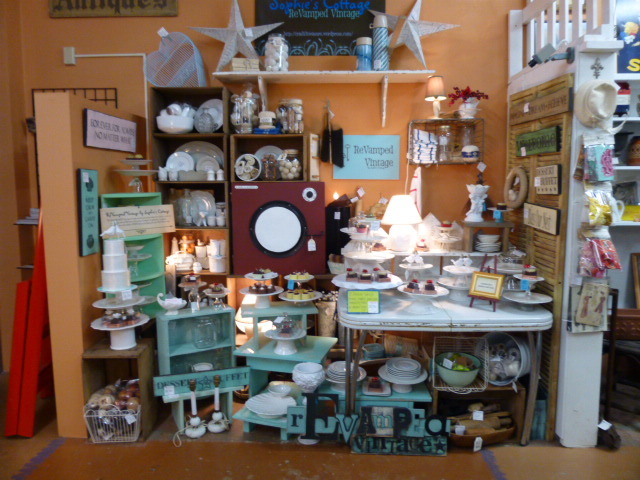 We even had to take the wall shelf (just below the sign) down because the hutch was too high and ran into it! WHY did I do this, you might ask? Well . 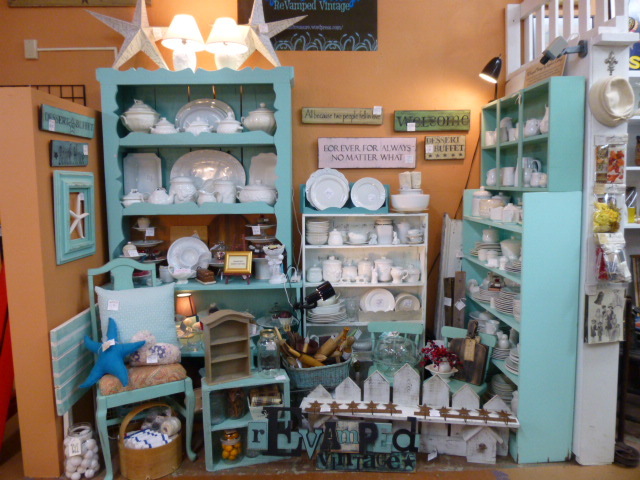 . . .when I got this second booth, it was my ‘original thought’ to line it with permanent shelves (as opposed to shelving that is ‘for sale’) and load them up with the majority of my ‘smalls’. THAT would lessen the number of smalls I had ‘cluttering up’ the furniture that was for sale in my big booth. BUT THEN I had this BIG vintage enamel table that I really wanted to get RID OF, so I used crates to build some temporary shelves in the wall space, and would change it over to the ‘original plan’ once that table sold. But here’s the thing . . . that table just would NOT sell!!! Not even marked down to half price. Now you might say “Well NO WONDER it didn’t sell with all the crap you have piled on it!” BUT, I kept it UNCLUTTERED for months; then just GAVE UP and decided to make the most of it as display space! sigh. The table STILL had not sold and I cannot fit it into MY car. 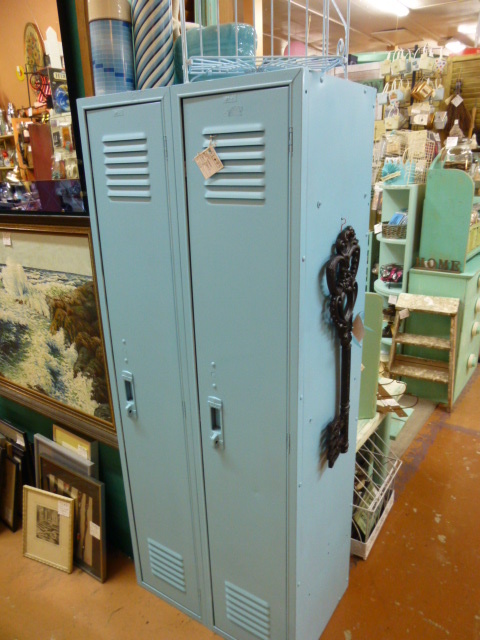 Michael had an old locker he wanted me to sell for him in my booth, so ‘the bargaining began’! 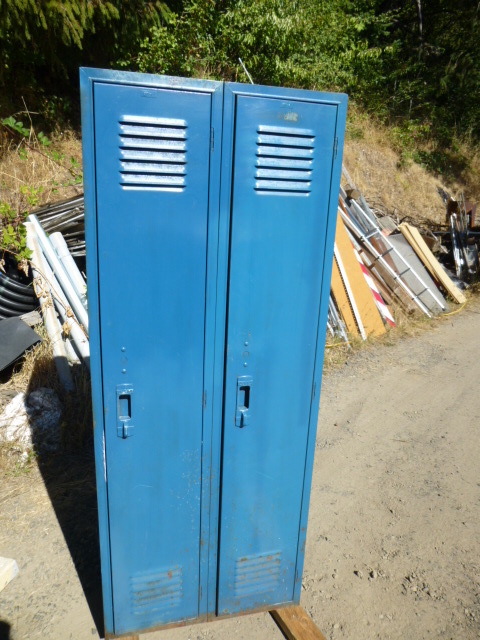 Since HE”D have to make a trip to Stars to deliver the locker anyhow; I’d make room for it if he’d help me re-do the booth AND take that dang table back to storage! Mission accomplished! The before doesn’t really look too bad in the picture, but believe me, it WAS bad! I had to paint a coat of KILZ primer on the wood shelves before I spray painted the entire inside white. 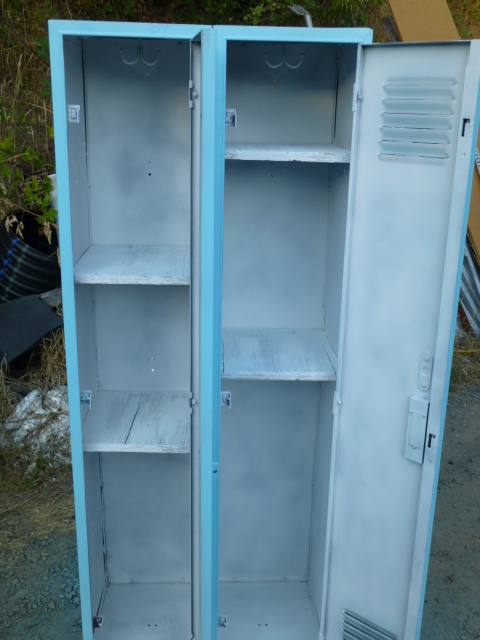 There were some other lockers at Stars and I was looking at them, comparing, seeing if my price was ‘appropriate’. I am SOOOOOOOOOOO glad I took the extra time and 2 cans of white spray paint. It makes a MAJOR difference. 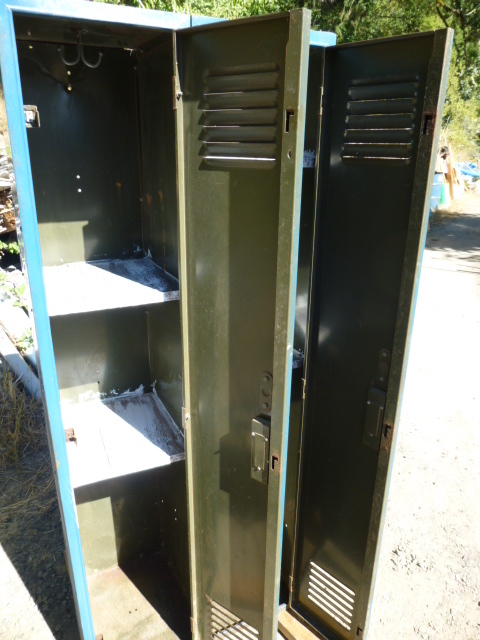 Opening the other ‘grungy’ lockers made you kind of shudder! Opening mine makes you go “ahhhhhhhhhhhhhhh”! And while it’s easy enough for ANYONE to go out and buy a couple of cans of spray paint and ‘do it themself’; I find they much prefer (and will PAY ) to have something that is ‘ready to use’. Don’t expect it to last long at $139.00!